I haven’t forgot you. The last two weeks have been so busy. I have been studying and have now only 2 out of 6 examination remain. in my last post I promise to show you guys what I bought in Amsterdam and here you go. In Amsterdam I finally found the perfect pair of white jeans !! I have been looking and looking, but couldn’t find a pair that was spot on with the size or not too see-through. Jeg har ikke glemt jer. De sidste to uger har virkelig været travle. Jeg har læst op, og har kun 2 ud af 6 eksamner tilbage. I mit sidste indlæg lovede jeg at vise, hvad jeg havde købt i Amsterdam og værsgo. I Amsterdam fandt jeg de perfekte par hvide jeans. Jeg har vireklig været på udkig, men enten passede de ikke eller også var de for gemmensigtige. Between all the preparation for my exams, I’m dreaming back to Amsterdam. Amsterdam really made a great impression on me, and I really hope that I soon will return to the city. What I really love about the city is the small channels, with is houseboats and small bridges. Beside that I like the medieval look of the houses and that the houses is really narrow. The history behind it is; the more money they had, the more wider house they build. When I was in Amsterdam I visited Museum Van Loon. The museum tells the story of the Van Loon family, which have been closely connected to the city of Amsterdam. The museum show how a prosperous family earlier have been living, and how the fashion was at that time. I must say the fashion at that time was lovely, just take a look on the pattern suit. Amsterdam has also great shopping opportunities. You can visit the nine streets or some more local markets, where you can find vintage items or crafts; like these handmade wood figures for painting. I promise that I in my next post will show you, what’s in the shopping bag. Maybe you can guess what it is? Now the most important part of the trip; the food. Amsterdam offers you all; from India, Chinese, to Italy, French. You can have dinner at a Michelin star restaurant, where I had a food-journey at Lastage, or small cafes. It is a good idea to check up on the eating places in Amsterdam. Do yourself the service and see what other people recommend on sites like TripAdvisor, because some of the places are great others just tourist traps. Some of the places I really can recommend”Ijssalon Tofanni” they have an amazing ice cream and sorbet. They even has a soy ice cream if you are lactose intolerance. On my trip in Amsterdam I also visit the small place “Omelegg“. 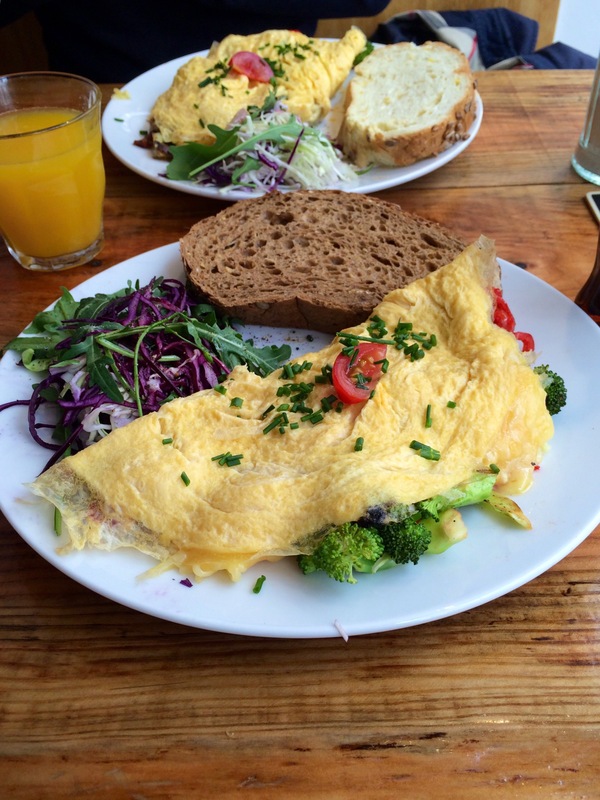 The place has the most delicious omelet, served with salad and bread. You really get a tasty meal for a fair price. I couldn’t eat mine up. I was so full that I skipped dinner and took a midnight snack when traveling home. The only thing I missed in Amsterdam was my WiFi. Sometimes you could find places/spots with free WiFi, but then the WiFi wasn’t good. I hope you enjoy this post, like i enjoy the trip. Have you ever been in Amsterdam? If so, have you visit some of these places, or what can you recommend? In May I want to match the sun, I want to wear warm tones, such as orange. We aren’t far away from the official summer and the days are more and more full sunshine. It is now time to wear skirts and dresses and show the skin. I have found two lovely ways to style the perfect summer look. I find the sneakers and the demin jacket absolutely perfect for both the skirt and the dress. For the sunny weather, I like to prepare my skin by using a body scrub. It cleans and removes the old skin cells, then it also add moisture to the skin. It also makes it easier for your body to become suntanned. Then I like to add a scent of summer and honey buy using Marc Jacobs Honey, one of my favorite summer perfumes . I have found the dress and top on Asos. The perfume and body scrub are from Ezzence, If you like the skirt, jacket and earrings, then you can find it on Spartoo and The lovely Nike sneakers are from Sportsmaster. The shops are some of my favorite, and when I’m shopping on these sites, I’m always checking out Rabble.dk to get discount. I maj måned vil jeg match solen, jeg vil iføre mig varme toner, som orange. Vi er ikke langt fra, at det officielt er sommer og dagene er mere og mere med solskind og varme. Det er nu tid til at iføre sig nederdele og kjoler og vise hud. Jeg har på lavede to smukke måder, hvorpå du kan lave det perfekte sommer look. Både denim jakken og skoene er ifølge mig perfekte til både kjolen og nederdelen. Når det bliver sådan et solskinsvejr, så kan jeg godt lide at forberede min hud, ved at bruge en body scrub. Den både renser og fjerne de døde hudceller, og tilfører fugt til huden. Derudover gør den det også nemmere for kroppen, at blive solbrun. Derudover så elsker jeg at tilføje kroppen en duft af sommer og honning med Marc Jacobs Honey, en af mine fortrækkende sommer parfumer. Kjolen og toppen er fra Asos, Parfumen og body scruben er fundet hos Ezzence. Er du vild med nederdelen, demin jakken og øreringen, så find dem hos Spartoo, og De smukke Nike sko kan findes på Sportsmaster. Disse butikker er nogle af mine fortrækkende online butikker, og når jeg handler på disse webside, så klikker jeg mig gerne forbi Rabble.dk, for at få rabat. What a week! I have last week been so busy, especially the studies are stealling my time and it means not so much time for Blue Ducklings. This week I had two school days from 8 a.m. to 5 p.m. So when I came home, I was just done. One of the day we went to zoo in Copenhagen with my biology class. It was quite exciting and fun, but it would have been more amazing if it hadn’t been freezing cold and starting snow, Yes snow in April. Next week also includes some school days from 8 a.m. to 5 p.m. and I’m so much not looking forward for these long days. But then there is my BF birthsday, yeah, only I don’t know what to give her, and she don’t know what to wish, any suggestions? Todays outfit is in my green turtleneck sweater and my floral skirt. The sweater has stolen my heart. The color is stunning and I it seems like the sweater goes perfect with almost everything, just like the skirt.